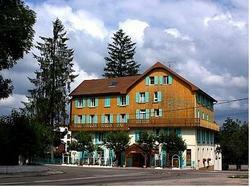 Hôtel des Lacs is located in the village of Chaux-des-Crotenay, 300 metres from the train station, and features a heated outdoor swimming pool in its garden by the river. There is an on-site restaurant serving regional cuisine. Each room includes a TV, a wardrobe and a private bathroom with a bath or shower and a hairdryer. Free Wi-Fi access is available in designated areas. A continental breakfast is served daily. At an extra charge, you can access the sauna, the fitness room and the hot tub or enjoy a massage. Hôtel des Lacs has a garage for motorbikes and bicycles, and free public parking is possible on site. This room offers a TV, a wardrobe and a private bathroom with a hairdryer and a bath or shower. Each room includes a TV, a wardrobe and a private bathroom with a bath or shower and a hairdryer.